Supporting materials from "Think globally and solve locally: secondary memory-based network learning for automated multi-species function prediction". 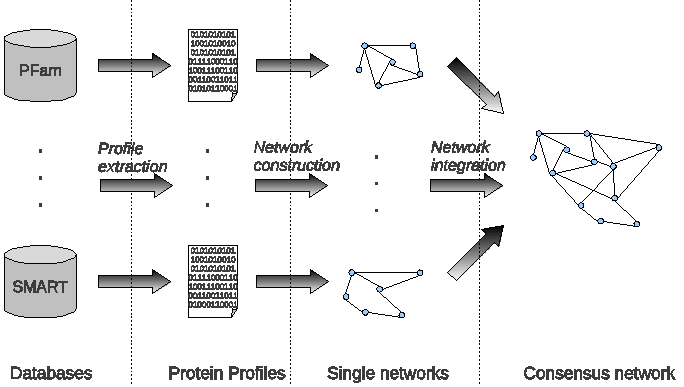 In the GigaScience manuscript associated with this data the authors propose a novel framework for scalable network-based learning of multi-species automated protein function prediction (AFP) based on both a novel algorthmic approach and the adoption of innovative technologies. The work focuses on the processing of big networks for multi-species AFP using single off-the-shelf computers, a very difficult and in most case unfeasible task, due to the main memory limitations of ordinary computers. The proposed algorithmic “vertex-centric” approach solves “locally” the AFP problem, by processing iteratively only small parts of the overall network, while still exploiting the global topology of the network. The computation is based on novel secondary memory-based technologies to overcome the main memory limitation of ordinary off-the-shelf computers. As an example, to show the feasibility and effectiveness of the proposed approach, 2 networks were constructed and analyzed. The results are contained here.